Airport Workers Around The Country Rally For Better Wages : The Two-Way Airport workers in New York City, Chicago, Miami and other cities held protests on Monday in honor of Martin Luther King Jr. Day. They called for their hourly minimum wages to increase to $15. Airport workers rallied Monday for higher wages near LaGuardia Airport in New York City. Around the country Monday, hundreds of airport workers protested in honor of Martin Luther King Jr. Day. From Newark, N.J., to Washington, D.C., to Chicago and Miami workers called for a minimum wage increase to $15 an hour. 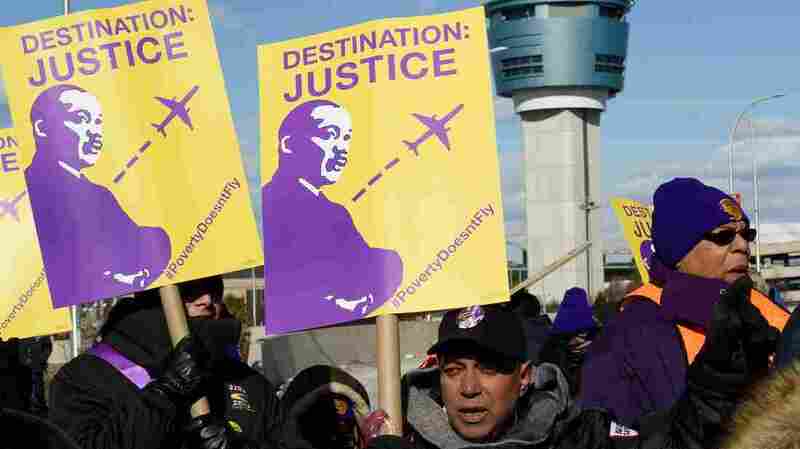 In Newark, workers carried picket signs of Martin Luther King through the airport. "If Dr. King were alive today, he would be standing alongside of us," said Kevin Brown, New Jersey's state director of the local service employees union, 32BJ SEIU. Some in the crowd were between work shifts at the airport. But many had the day off from working as baggage handlers and airplane cabin cleaners, including 51-year-old America Hernandez of Newark. Hernandez works for PrimeFlight, a contractor for United Airlines. She cleans about 20 airplane cabins, from 10 p.m. to 7:30 a.m., for $10.10 an hour. Hernandez says her salary is enough to pay the bills for her and her four children, but what's left over, she says, is not enough to even buy a piece of candy. "We're just tired of struggling just to get by. It's too much living paycheck to paycheck," says Raquel Brito, a baggage handler at Chicago O'Hare International Airport. The 20-year-old makes $11 an hour. That's why, Brito says, she protested Monday outside United Airlines' headquarters in Chicago. Fifteen dollars, she says, is a an hourly wage she can actually live on. United Airlines and PrimeFlight did not respond to NPR's interview requests before broadcast. Today's protests come during a national debate about minimum wage increases. Some economists say it's not clear what the actual economic impact of an increase would be. "We don't really have any great confidence about what a $15 minimum wage would mean, whether across the board or for a particular set of workers," says David Neumark, an economics professor at the University of California, Irvine. In general, he says, raising the minimum wage for workers also raises prices of products and services. "At some level, they increase prices," he says. "People buy less from those businesses, and those businesses use fewer workers. And that channel is arguably a lot weaker at airports." Neumark argues that raising airport wages wouldn't necessarily have a big impact on whether travelers buy plane tickets. "People at airports aren't poor on average," he says. "It's a high-income segment of the population going through airports." The wages of airport workers also don't make up the bulk of what it costs to fly, according to Arin Dube, an economics professor at the University of Massachusetts Amherst. "When you think about what goes into the cost of flying from, let's say, Boston to San Francisco, the cost of baggage handlers and other low-wage workers in wages, in determining the cost of flying, is very tiny," Dube says. He argues that higher minimum wages could result in a benefit to airline companies. "When you raise wages of low-wage workers at the airport, you may also increase their productivity," Dube says. Neumark though, isn't convinced. He says having to pay more for low-skilled workers at airports may push companies to hire more higher-skilled workers instead.